Adam Bhatti already uploaded lots of short, little PES 2015 clips over the last weeks, and today he again updated his Vine account adding two new short PES 2015 videos. 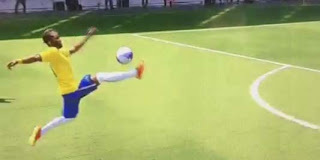 One of the two new PES 2015 videos is showing Neymar controlling the ball exquisitely before scoring with his left foot, while the other PES 2015 clip shows Hulk doing a tricky cut-back pass. Here are the two new PES 2015 short videos uploaded by PES Brand Manager Adam Bhatti.